"Gran Turismo 2 (commonly abbreviated to GT2) is a driving simulator / racing game for the Sony PlayStation. 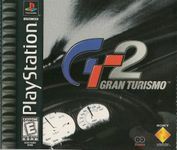 Gran Turismo 2 was developed by Polyphony Digital and published by Sony Computer Entertainment in 1999. The games serves as a sequel to Gran Turismo. It was well-received publicly and critically, shipping 1.71 million copies in Japan, 20,000 in Southeast Asia, 3.96 million in North America, and 3.68 million in Europe for a total of 9.37 million copies as of April 30, 2008, and eventually becoming a Sony Greatest Hits game. The title received an average of 93% in Metacritic's aggregate. Gran Turismo 2 was also the first PS1 game to be emulated on the Dreamcast via Bleemcast." Source: Wikipedia, "Gran_Turismo_2," available under the CC-BY-SA License.